Imagine this scenario: you went on a great trip, or experienced a great event, and took some amazing photos. Laughs were had, pictures were shared on Facebook or Instagram, and now those memories are buried in a digital folder somewhere. 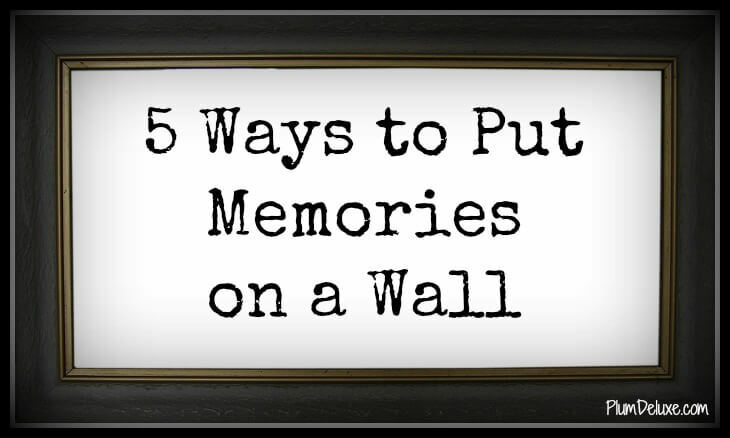 Why not put some of those photos out on display and celebrate those memories? Displaying pictures in your home creates a homier atmosphere, starts conversations with visitors, and can even cheer you up on a bad day. 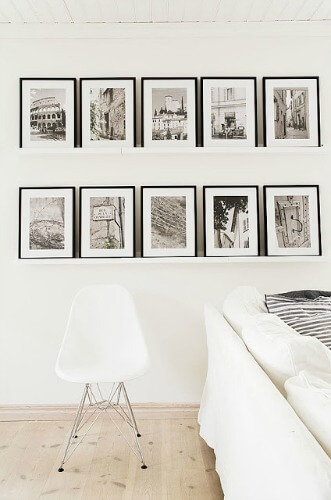 But skip plastering your walls with every photograph (with the boring photo frames) and get creative. Here are some ideas to display your picture memories by creating something that complements your home and your sense of style. I think colorful frames are a good place to start, especially if you are a little nervous about putting photos up without making it look like an amateur job. If you use the same color and type of frames it creates a uniformity that will keep it looking polished. (I would suggest varying the size of frames, though.) You can match the color to something already in the room, or choose a complementary color that will really make the frames pop. 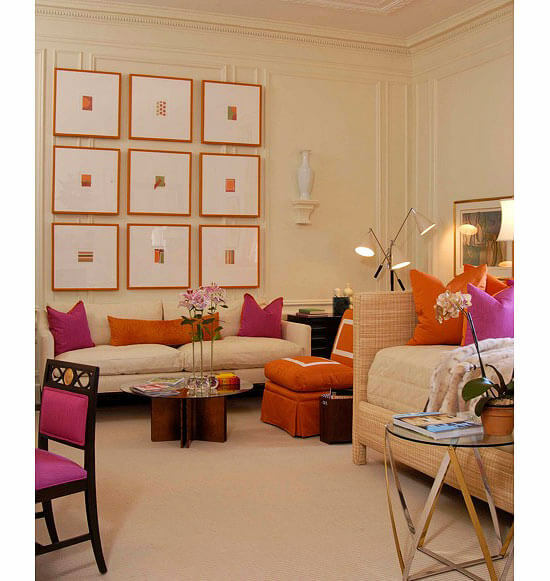 For example, if your room is full of blues, you could choose orange frames to complement the color scheme. You can look here for more about using complementary colors in your home. For those who are more adventurous, there are shadow boxes. When you use shadow boxes, you can line them with scrapbooking paper or maps, and then put in trinkets from the memory, along with the photos. Target has a excellent-looking shadow box that would be perfect. Then you could surround the shadow box with more framed pictures from the memory. 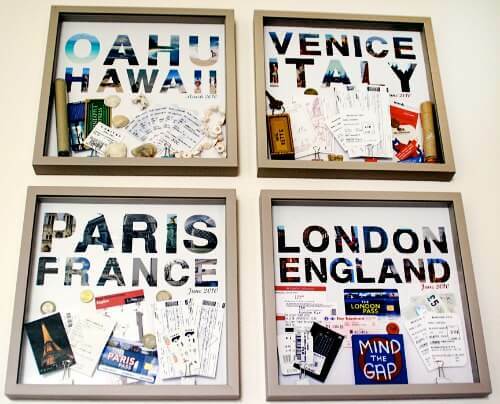 This is also the perfect way to display those souvenirs that always seem to end up in a junk drawer. Sometimes photos look the best without frames. If you have a bold-colored wall that you want to hang the pictures on, this could be your best option. Fractureme.com prints your photos onto glass, making a beautiful frameless display that easily mounts on your wall. Printing the photos on glass creates an extra special and unique feel to your memories. This might be something that you want to consider for your wedding pictures. They are going to be displayed for a long time, and this display will look good regardless of how you update your décor through the years. 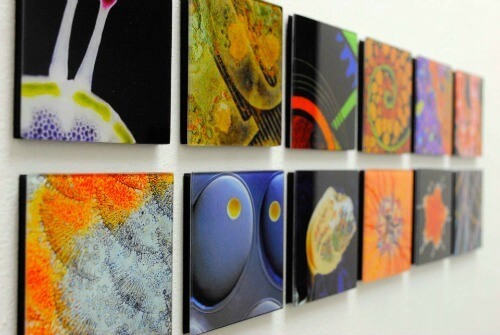 You can also bring the look of fine art into your home with photo canvases. Printing your photos on wrapped canvas can be a little more spendy, but it is worth it when you look at the finished product. This kind of display would be perfect above your bed or couch. If you take a look on Pinterest, you will see that putting photos on a set of shelves is very popular – search ‘photo display’ for some wonderful inspiration. (While you are there, don’t forget to follow us, too!) By arranging pictures on shelves, you can really express yourself with several different elements. Like sleek and modern? Pick some nice black boxy-looking shelves. Shabby chic? Go to your local antique shop and pick out some nice vintage shelves with cornices. Then coordinate the frames and mats to work with the look of shelves. Shelves can help keep a modern and contained look to the display. If you are feeling crafty, you can create your own unique, homemade display. I love this tutorial on using shoe boxes to show off items. You can paint the boxes and use a lot of the same elements that you would use in a shadow box. And as an added bonus, you probably have everything you need in your house right now. Have a bunch of old CD jewel cases? Turn them into small photo boxes. This could be the perfect solution for flaunting photos at the office. My absolute favorite is creating your own photo clock. 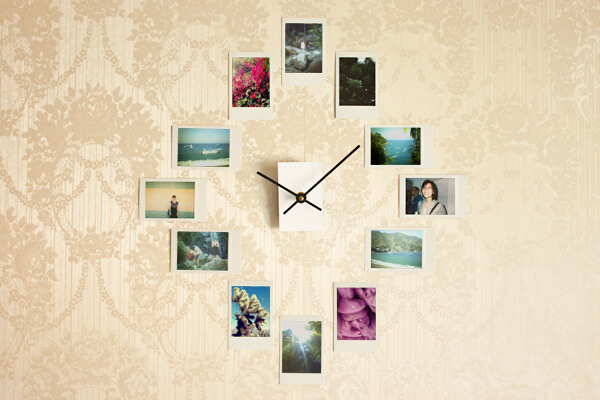 Display your memories and tell the time! This is also fantastic when you want to change things up because you can easily replace the photos producing a whole new look, but still keeping the original clock face. Displaying memories is important. You spend a lot of time and money making those memories, and you should be able to enjoy them even when the actual event is over. Don’t be intimidated by not being ‘creative’ enough. You can trust your instincts, and when you are faltering, you can always ask a kind friend for her opinion. There is no excuse not to take a Saturday afternoon and turn one of your walls into a beautiful display of memories. Carey Ruhl is the Operations Concierge and Chief Socialite at Plum Deluxe. She is also a fabric/surface designer with her own business, Empire Ruhl. Follow her on Twitter @careyruhl or Facebook.